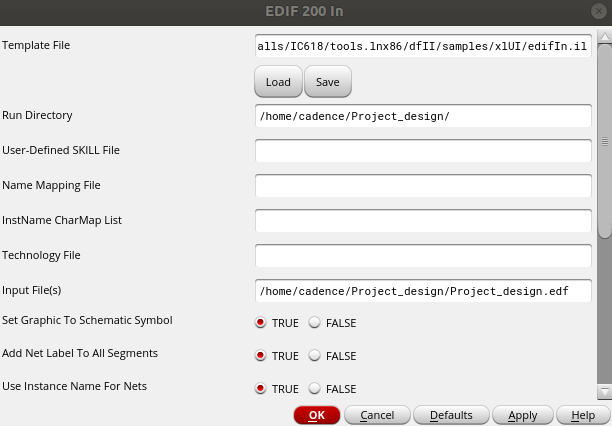 Given that the storage format for S-Edit is EDIF (or a variant of EDIF), the best route is to use the EDIF export from the S-Edit tools and then import that into Virtuoso. I've had good success with that, although I have had to do some pre- and post-processing to clean things up - sometimes due to PDK incompatibilities, sometimes due to limitations/bugs in both EDIF interfaces (in the source and destination tool). You may want to try this and if you have trouble, please contact customer support - although it might need a service if the work needed is extensive. Thank you very much! I will give it a shot. I ran into a few problems while implementing your solutions. The following window popped up when I tried to import the EDIF. The Run Directory and Input File sections made sense to me, could you please tell me what is to be added in the other sections? error at line :1 between 'edif' and 'Project_design' Unexpected character " " in input error on line 1: between 'edif' and 'Project_design' syntax error Translation complete. There were 0 warning messages and 2 errors in the design. I would really appreciate any suggestions that could aid me. Thanks for going through this! and show me what each outputs (the second will output just the first two lines of the EDIF file, but show any unusual characters).